Roger Ebert: This movie is more sophisticated and complicated than the Westerns of my childhood, and it is certainly better looking and better acted. But it has the same spirit; it awards itself the carefree freedom of the Western myth itself - the myth of a nation "endlessly realizing Westward," as Robert Frost had it, with limitless miles of prairie and desert and mountain interrupted only occasionally by a village with a church, six saloons and a Main Street wide enough for a dozen men to shoot at each other without all of them necessarily getting hit. NYTimes: Lawrence Kasdan, who produced, directed and co-wrote the film - and presumably came up with its wonderful title -doesn't seem to be commenting ironically on the western form. Nor is he determined to update it. He simply approaches it from a present-day standpoint, and the result is an energetic revival with some significant differences in scale. ''Silverado'' is sufficiently modern to make its landscapes bigger, its people smaller and its moral polarities less powerfully distinct than those of simpler, more starkly beautiful westerns gone by. Film Yap: So is “Silverado” an homage, a parody or something else entirely? After seeing it again for perhaps the dozenth time, I confess I still haven’t decided. My gut tells me it’s a serious paean, a recreation of the cowboys-and-Indians games (minus the Indians) Kasdan & Co. grew up playing. But then I watch again scenes like Emmett practicing his gunplay, and I wonder still. There’s one part where he’s aiming at a cactus plant with his rifle from maybe 50 yards away. Not only does he hit the plant, he shoots off individual spines, one at a time. This is so absurdly ridiculous that I can’t believe the filmmakers taking it seriously, or imagining anyone in the audience doing so, either. It’s stuff like this that makes me think the movie has just gone momentarily goofy. Sometimes I laugh at “Silverado,” and sometimes I just sit back and admire its fanboy, fetishistic take on the Western. What I do know is, whenever I watch this film, I’m grinning as wide as the dusty plains. I am positive that his movie and The Untouchables are responsible for my otherwise inexplicable soft spot for Kevin Costner. This is a big, goofy movie, but it's fun, and it hit all of the sweet spots that I, as a nine year-old, could really dig. I've probably seen it a dozen times and I think it holds up because of the combination of its playful spirit and its naked appeal to what I think of as the best feelings evoked by the golden age of westerns. 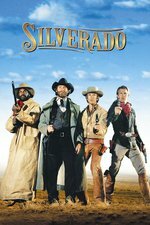 What I really love about Silverado was it wasn't forced to decide which of the multiple Western stereotypes it would follow- it would include ALL of them in their heroes, from old serials, to spaghetti western. And the result was incredible. One of my favorite lines comes from this film: I don't want to kill you and you don't want to be dead. My favorite part of this is John Cleese's cameo as a no-nonsense sheriff. I don't know how many times I've said "As you may have guessed, I am not from these parts." No one ever gets it.